We finally have pictures!!! 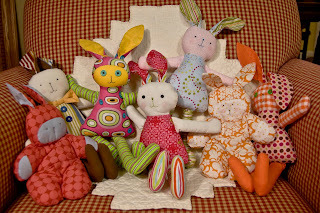 Here is a group picture of all the bunnies we have made so far...aren't they so cute! We have literally had to pry them away from Anne tonight...so sad. Well, just remember Easter will be here before you know it and we would LOVE to make your little one a bunny! 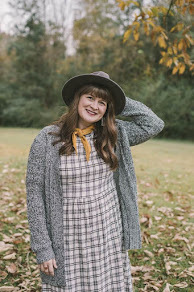 Here it is...the first post on my Hello Dearie blog! I have been wanting to start this for a while and decided that the only way to go was to just begin. Cyndi (my mother in law) and I have started a business on www.etsy.com...I am totally addicted and you should be too! Right now we only have 3 items listed, but my goal is to have a lot more by the end of this week! I have a lot of ideas for my headbands and Cyndi is making the cutest little stuffed friends you've ever seen! We are so excited, but just need TIME to create! We are going to be working on bunnies for Easter...so if you have a little one and need a bunny for the basket, let us know! We would love to create one of these little guys for you! I will post pics asap! I hope you will come back as I update and don't forget to check our etsy store!! !